No need for reservations, one nibble of these delicious slices of Dried Cantaloupe is sure to transport you to a tropical island paradise. Bright orange, sweet, chewy, and delectable - possibly the perfect snack. We've captured the cool, refreshing and sweet taste of freshness in these beautiful slices of Dried Cantaloupe. 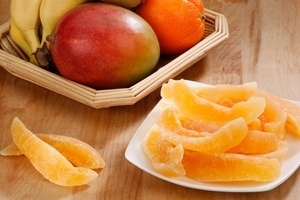 A quintessential summer treat, these deep orange slices not only look beautiful and scrumptious, but they're good for you. Cantaloupe is packed with beta carotene, an important nutrient for maintaining good vision. Chock full of antioxidants, eating Cantaloupe is a delectable way to keep damage from free radicals at bay. 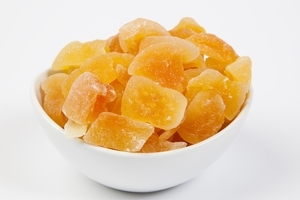 Did we mention that Dried Cantaloupes are high in fiber and complex carbohydrates? All important ammunition in the fight against heart disease, stroke, and cancer. 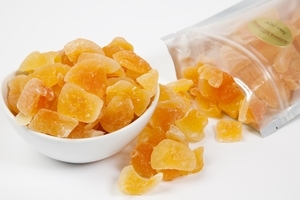 The health benefits of eating delightful and appetizing Dried Cantaloupe aren't the only reason you'll want to order this treat in bulk. Cantaloupe becomes candy-like when dried, and can make a wonderfully nutritious substitute for hardy candy. They're versatile, too. Chop them up and add to muffins, cookies or cakes for a fast and easy way to boost texture and moistness. Yum! This is a must for tropical fruit lovers.